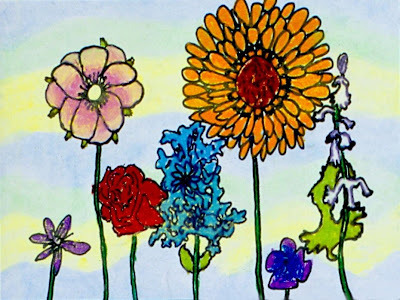 The children draw flowers, color them with oil pastels, and then apply a fluorescent watercolor wash. For all ages. Plan 2 sessions. Lay out the artificial flowers so that each one can be seen individually. Set out drawing paper and black markers or crayons. 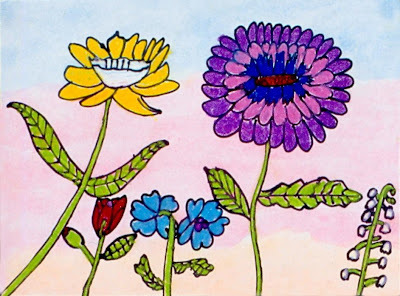 Explain that in this session the children will be looking carefully at flowers and drawing as many as necessary to fill their papers, and in the next session they will be adding colors. Show the children that while flowers may look complicated, they often consist of the same shape repeated over and over again. Holding up a flower as an example, point out the shape of a single petal and its repetition. Then discuss the parts that make up the flower's center, as well as the shape of its stem and leaves. Have each child choose a flower to take to his/her work area. After looking carefully at its parts, they should draw the flower on their paper and then return it to the display and choose another to observe and draw. Continue choosing, observing, and drawing flowers until the papers are filled. 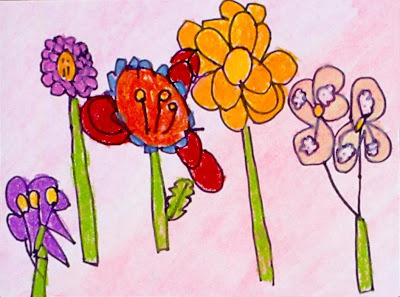 As the children work, remind them of the importance of referring to their flowers while they draw them. Set out the drawings from the previous session. Lay out the artificial flowers again so that each one can be seen individually. Set out the oil pastels, newspaper pads, and paper towels. Prepare and test several colors of watercolor wash by adding enough water to the paints so that they will glide over the oil pastel without adhering to it. Since paints vary in their consistency, this needs to be done by trial and error. Cover a work area with newspaper and set out the prepared washes with brushes. 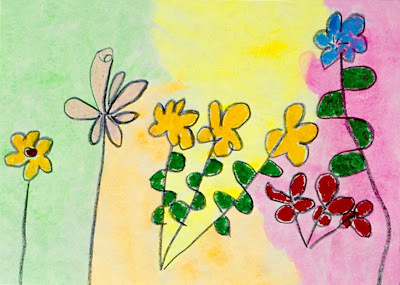 Explain that in this session the children will be coloring their flowers with oil pastels, which are a blend of oil and pastel, and then filling the backgrounds with a watercolor wash, which is made by thinning paint with enough water to resist the oil in the oil pastels. When the wash is applied, it will cover only the areas where there is no oil pastel. This process is referred to as the resist technique. Demonstrate how to use oil pastels. For a smoother and easier application, place the drawing paper on a pad of newspaper. Emphasize the importance of pressing firmly with the oil pastels to bring out their color intensity and to apply enough oil to resist the watercolor wash. Be careful to color around any details drawn inside the flowers, since oil pastels can cover marker lines. 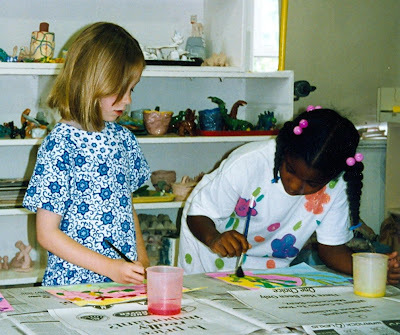 Warn the children that brushing away any loose bits of oil pastel will smear their pictures. Instead they should blow the bits away gently or shake their paper upside down. Have paper towels available to keep the oil pastels clean. Demonstrate the resist technique by loading a brush with a watercolor wash and gently pulling it across the drawing with a single light stroke. Fill the brush each time before pulling it across the drawing. If puddles form, the excess paint can be dragged onto the newspaper covering the work surface. Point out how the water is resisted by the areas covered with the oil pastels. 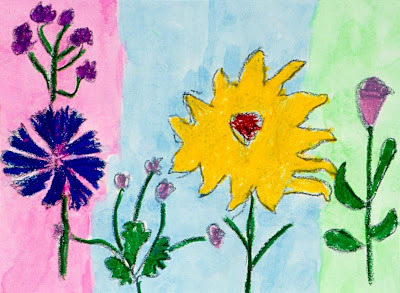 Have the children put their drawings on newspaper pads and color their flowers with oil pastels. They can refer to the colors of the flowers in the display or choose their own colors. Remind them to push firmly so enough oil will be applied to resist the watercolor wash. When the flowers are colored with sufficient oil pastel, have the children apply the watercolor wash. Note: Using several colors of watercolor wash on a single drawing will produce stunning effects. Avoid overlapping the colors since fluorescent paints can become muddy when mixed. It's important to test the watercolor wash ahead of time. If it is not thin enough, it will cover the oil pastel. The oil in the pastels dries fairly quickly, so the oil pastel and the watercolor wash must be applied in the same session. Using artificial flowers allows the children to actually handle and explore the flowers' shapes and parts. Silk flowers are especially close to real ones and can be used over and over. Sometimes important detail lines get covered with oil pastel. If this happens, you can go over the black lines with marker or crayon after the paint has dried. Are the papers filled with flowers? How does the watercolor wash effect the flowers? How many flowers should I draw? Can I draw the same flower more than once? Do I need to draw every petal on this daisy? I’m going to use all the paint colors. It works! It really works! Look at my flowers peeking through the paint! Draw as many flowers as you need to fill your paper. Different shapes and sizes are nice, but repeating the same flower will also work well. If there are lots of petals, you decide how many you will need in your drawing. You may choose which colors of wash you’d like to use. Just be careful not to let the colors run together, since fluorescent paint can become muddy when mixed. The watercolor wash fills up the background and makes your beautiful flowers appear even brighter!